David Law admits he is having to acclimatise to being a European Tour winner - as well as the soaring heat - this week in Malaysia. Law and Stephen Gallacher are the only two Scots playing in this week's Maybank Championship. It comes a month after Law's his maiden title win in Australia. "Expectation changes, whether it's from yourself or other people, and I've struggled with my game a little bit the last couple of weeks," said Law. This is the 27-year-old's debut season on the European Tour, and he won the ISPS Handa Vic Open in February, but has missed the cut in his last three events in Australia, Oman and Qatar. 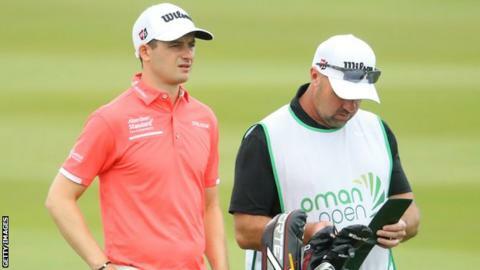 "I've not played well at all since I won," said Law, who has taken on board the advice of a former Open winner. "Paul Lawrie said to me that as much as you won't feel things have changed, your circumstances have changed a lot and it does take time to get used to and get your head round. "As much as I've enjoyed the win and everything that's gone with it, it's time to put that behind me and try and have more success. "It'll be piping hot here in Malaysia but I deal with the heat pretty well - for a Scotsman anyway - so we'll see how I'm doing on Thursday evening." Glasgow Warriors head coach Dave Rennie on Aaron Cruden, beating Edinburgh, and why Adam Hastings can be a better 10 than Finn Russell. Former Hibernian goalkeeper Yves Ma-Kalambay tells BBC Scotland about his friendship with Didier Drogba, the opponent who touched his "privates", and accepting an invitation to fight manager John Hughes. Watch as Rangers' injured Kai Kennedy is dragged off the pitch by Celtic’s Liam Morrison before shuffling back on in an attempt to get the game halted.